Kumano Hayatama Shrine (熊野速玉大社) is one of three Kumano Grand Shrines. There are thousands of Kumano Shrines in Japan, and this is the top of them. It is located in Shingu, Wakayama Prefecture. Legend said, it was established about 2,000 years ago. 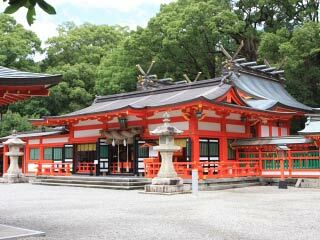 It enshrines Izanagi no Mikoto, Izanami no Mikoto and other 12 gods. In the time of Emperor Koken, this shrine was entitled the best sacred spot in Japan. As the one of great historic site of Kumano, it is registered as UNESCO World Heritage Site. It is very important to worship all three Kumano Grand Shrines. Kumano Shrine helps salvation of our three lives. Hayatama Shrine helps the salvation of the pervious life. Nachi Shrine helps the salvation of the current life. Hongu Shrine helps the salvation of next life. Kumano Shrines are highly respected for over thousands of years. Kumano Hayatama Shrine is one of three Kumano Grand Shrines. There are thousands of Kumano Shrines in Japan, and this is the top of them. In the time of Emperor Koken, this shrine was entitle as the top shrine and "Kumano Gongen." Gongen is the Shinto philosophy that the god change the appearance to the body of buddha so that god can exist to our world. In Nara period, Hayatama Shrine became the salvation of past life by enshrining Yakushi nyorai. Planted by Taira no Shigemori.